Dream big first, then plan. I have a confession to make. For most of my adult life, actually, no… For ALL my adult life, I’ve hated work. Yes, I know, hate is a very strong word but it’s entirely appropriate for what, I can assure you, was a very strong emotion. As you can probably imagine, there were a LOT of very painful Monday mornings, struggling to drag my sorry self out of bed and off to work. And, a lot of wished away days. I tried everything I could think of to reconcile myself to my lot in life but mostly, that reconciliation amounted to finding ways to dull the pain. Shopping. Partying. Moving: jobs, industries, cities. I even tried working as a horticulturalist at a plant nursery which was as far away from my usual profession (Technical Writing) as you could possibly get. Even part time, that job nearly did my head in. Not the work so much, I enjoyed being out in the fresh air and sunshine (the rain, too) but every moment of our day was managed. Start time. Finish time. Morning and afternoon tea break. Lunch. Sometimes, it seemed like even our bathroom breaks were regulated. As I mentioned in a previous post, timesheets (specifying what you did, when and for how long) were not my favourite pastime when I worked in IT and it turns out the opposite, being told what to do and when I dislike even more! When you throw in the stress of a divorce and full-time single parenting to working full-time in a job that drains you rather than fulfills you, something has to give. And it did. A stomach ulcer. Insomnia. Colds that never seemed to go away. And, the ever present headache. Life was not meant to be like this. I felt hopeless. I know it might sound as though I lacked the guts to tough it out or resilience or maybe even that I lacked a strong work ethic. What I can say is this: I was immersed in a permanent struggle between society’s expectations of what I should do and the dream I had for myself. If what James says is true, what was I but a bundle of frustration, anger, and bitterness? I needed to change my life. I needed to be brave, face my fears and dream big. And, you learn to focus. My dream has changed very little over the last 30 years. In fact, when I look closely at my first ever memory of this dream, back to when it was just a desire bubbling up to the surface of my mind, I was barely in my teens and the truth is, the only thing that’s changed is the size of the land I live on. And, that change is purely practical, a smaller plot of land because I now know how much effort it takes to keep a larger garden under control. But, that’s about the only change to that long-held dream for myself. A little cottage with a productive kitchen garden, flowers for cutting and plenty of fruit trees. I’d be working from home, writing and drawing, taking time off in the summer to enjoy the beach. It might not sound like much to you, but for me, it’s my version of heaven. It is more than enough for me. 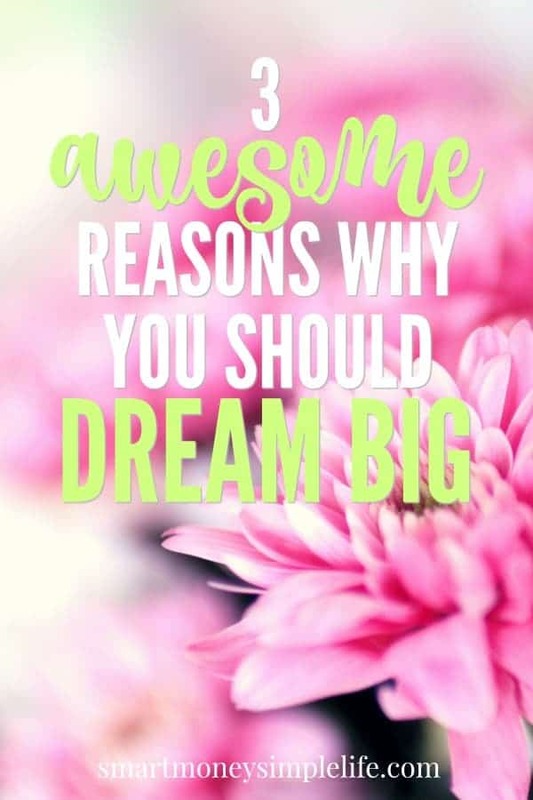 Your idea of ‘dream big’ might be a lot bigger and that’s OK. It’s the act of reaching beyond where you are to where you want to be that’s key here. So, dream big! About 10 years ago, I began actively pursuing the life I chose for myself. That’s just a natural outcome of trying new things, of finding new ways of doing things. The mistakes are the lessons that show us what we don’t know yet and need to learn. I think I’ve earned a PhD in mistakes! I’d like to say I only make a mistake once but that would be a lie. Sometimes, I make the same mistake three or four times. Just to be sure! I’ve tried different jobs, and businesses. I’ve tried different ways of working: contract, freelance, part-time and full-time. But, in the end, it’s always come back to one crucial factor: I like to control my own environment and my own work. Some might translate that to mean I don’t play well with others, and sometimes I don’t but it’s more about the frustration of seeing other and perhaps better ways of doing things and not being able to act on them. I don’t regret any of it. Every mistake I’ve made has reinforced what I truly want from life. Last year, I nearly made another mistake. I was very tempted to go back to the 9 to 5 grind after working my online business full-time for a few years. I’d lost my passion and my focus and my business turnover was clearly reflecting that. It was while I was at one particular interview I realised I was totally kidding myself. There was no way I could play the corporate game again. Certainly not in that kind of environment. But, never say “never!” right?. If I see a job that looks like it can provide a great environment as well as interesting and stimulating work, I’ll go for it. That job with a government department? Nope. I’d be miserable again in a week. I’m worth more than that. My life is worth more than that. Now, I’m focused on a writing project that feels like it’s bringing me much closer to my dream life. Yes, it requires sacrifice, just not the heart and soul variety. Will it result in money, right now? Will it bring me closer to my dream? If the answer is to both is no, then I file the idea away for another day. When I’m living my dream, I can begin to explore those other ideas and opportunities. In the meantime, I’m focused on working toward my big dream, everything other than paying the bills can wait. Maybe it’s just me, but I suspect it’s not, that freedom and autonomy seem unattainable when you’re so deeply buried in other people’s dreams you can’t see over the partition around your desk. When you’re following other people’s rules for how to live your life. When a secure job is the only goal. Life is too short for that. Remember, if you’re not working toward your own dream, you’re actually working for someone else who took the initiative to dream big. Will you be happy to live each day as you do now for the next year? Five years? Decade? What are you willing to sacrifice to make your dream come true and what are you sacrificing now to live someone else’s dream?